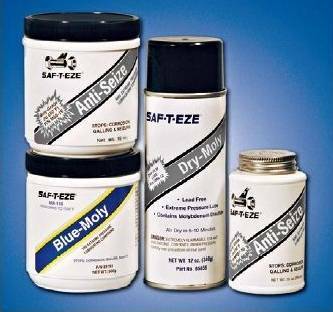 SAF-T-EZE® Moly Grade Anti-Seize is compounded with Molybdenum Disulfide for extreme pressure applications. This low friction lubricant even prevents wear or galling on gears or splines operating under high load at low speed. In fact Moly Grade Anti-Seize will withstand pressure to 500,000 psi and perform to 650ºF (340ºC) Moly Grade and Moly 50 are not recommended where moisture is present and high temperature encountered, however. For performance to 2500ºF (1370ºC)., see the Blue Moly Grade Anti-Seize or Dry Moly Film for performance to 2400ºF (1315ºC). Moly Grade Anti-Seize is a low friction lubricant that prevents wear or galling on gears or splines operating under high load at low speed. Moly Grade Anti-Seize will withstand pressures to 500,000 psi and perform to 650ºF (340ºC). This product is also recommended where copper contamination must be avoided. Use on threaded parts, bushings, gears, valve stems, chain sprockets, levers, hinges, pivots, rollers or as a gasket release agent, etc. Moly 50 Anti-Seize is a low friction lubricant that prevents wear or galling on gears or splines operating under high load at low speed. Moly 50 Anti-Seize will withstand pressures to 500,000 psi and perform to 650ºF (340ºC). This product is also recommended where copper contamination must be avoided. Use on threaded parts, bushings, gears, valve stems, chain sprockets, levers, hinges, pivots, rollers or as a gasket release agent, etc. Blue Moly Grade Anti-Seize is recommended where very different metals are used together such as brass and steel. It is also used where high Nickel alloy metals such as stainless steel, or where Titanium or other hard metals are involved. Blue Moly Grade Anti- Seize is also used where metals such as copper cannot be present, such as in caustic, ammonium or high acidity processing plants. Surfaces need not be cleaned before application unless grit or low quality oil/grease is present and ultimate performance is required. Use on threaded parts, bushings, gears, valve stems, chains, sprockets, levers, hinges, pivots, rollers, heat exchanger bolts, manifold bolts, or as a gasket release agent, etc. Dry Moly Film is recommended for general plant maintenance and specifically for environments where clean, dry lubrication is required. The product lubricates and protects metal parts from wear and corrosion. The greaseless finish repels dirt and dust, and does not rub off, thus making it an ideal lubricant for dirty, dusty environments, where dirt can clog and interfere with grease based lubrication. Dry Moly Film is resistant to water and water-based solutions. Exposure to temperatures above 300ºF (149ºc) will add resistance to solvents. In maintenance applications, it is an excellent choice for lubricating dry bearings, or as an "easy-off" coating to repel dirt buildup in exhaust systems. The dry finish makes it excellent for applications where repeated handling of the lubricated parts is common. Dry Moly Film is used in general plant maintenance, metal working industry, aerospace, wood and paper mills, textile industry. 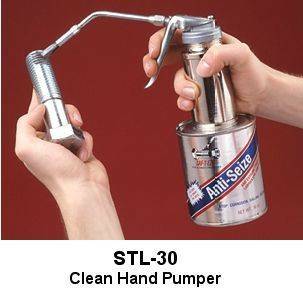 Use to lubricate and protect door hinges and chutes. Excellent choice for pre-applied lubrication of threaded and non-threaded parts. Use as a lubricant for dry bearing surfaces, slides, conveyor chains, exposed gears and shafts, valve stems and press fit applications. In Heavy Equipment/Automotive applications, it is an ideal lubricant for brake systems, cables, gears, and couplings. It has extensive applications in the aerospace industry, where a dry film lubricant is used on gas turbine engine blades, valves, bearings, etc. Dry-Moly is an air drying lubricant that offers properties in a resin bonded system. It requires little or no surface preparation, is easy to apply, provides excellent adhesion to substrates, and dries quickly.